The oldest credit union in Rochester, Minnesota, First Alliance Credit Union was founded in 1932 during The Great Depression by 7 teachers and firefighters. First Alliance's guiding principle back then still stands true today; all for one. They provide compassion, guidance, and resources to promote financial well-being for all of their members, through every stage of life. First Alliance embarked on a major brand evolution in May of 2016 and was looking for a certified HubSpot partner to help them complete their transformation with a new website and HubSpot integration. The old First Alliance website wasn't mobile responsive, there was no blog in site, and they were preparing to launch a new online banking system that had to be easily accessible for their members. After months of searching for an agency to partner with, First Alliance decided to go through an RFP project in August of 2016. 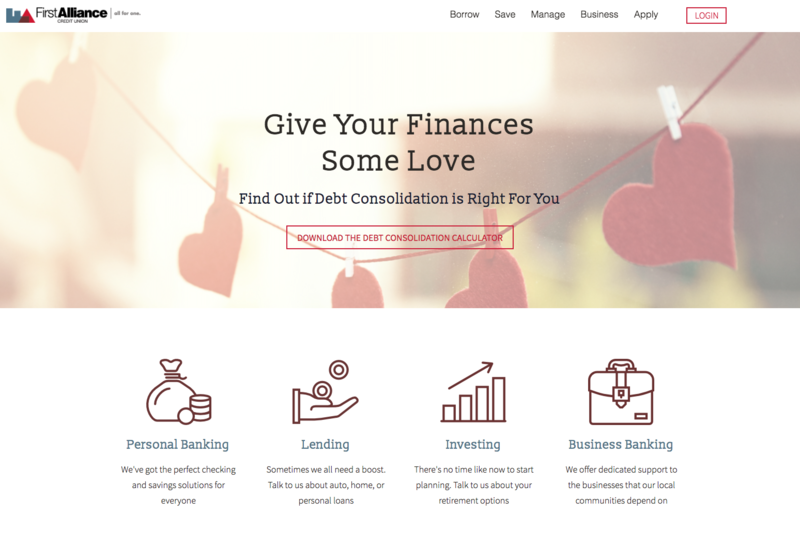 Many presentations and proposals later, in February of 2017, First Alliance Credit Union decided to engage with NR Media Group to help them integrate HubSpot and redesign their website. It was a David vs Goliath situation, with one marketing person executing First Alliance's strategy against a highly saturated financial services market. With time ticking on their website project and their online banking launch, we knew we had to work together efficiently reach First Alliance's goals and help give them the resources they would need for success. The first step of our process was to redesign the First Alliance Credit Union website. The existing website was not mobile-responsive nor was it optimized for organic traffic. At the time, First Alliance had implemented a short-term marketing solution that was a series of landing pages that addressed the need for responsive design while staying focused on key product sales. All external marketing efforts, such as SEM, display, and retargeting, directed visitors to this website. In order to build the best website for First Alliance's needs, we conducted an internal content audit, redesigned their sitemap, and built a wireframe for the new site. From there, our team designed and implemented custom templates and creative designs that complimented the company's new branding. We also integrated the new online banking system with the website, and the new site launched in June of 2017. While we were redesigning the website, training their marketing team was also critical to First Alliance's success. In order to help them execute an effective inbound marketing strategy, our team trained the now two-person First Alliance Marketing team on fundamental inbound methodologies as well as best practices and strategic guidelines for content creation and distribution. In two short months, the First Alliance team was executing a strategic content cadence and social posting schedule. To date, they have over 30,700 blog views and social media has driven over 1,400 sessions on their website. They have also launched several multi-channel campaigns that utilized blogging, email marketing, social posting, and Facebook Live videos to increase engagement and continue to provide financial resources for their audience. First Alliance has continued to grow and show a passion for learning in order to continue their successful digital marketing strategy. Since the website launch in June 2017, First Alliance’s website has seen more than 738,000 page views. First Alliance ranks in the top ten search results for more than 115 keywords. To date, they have over 30,700 blog views and social media has driven over 1,400 sessions on their website. Today, NR Media Group continues to work with First Alliance on help to grow their HubSpot and inbound marketing tactics and we are excited to continue to implement new strategies and content for their audience.